Nic.Ru Review 2019: Is Nic.Ru a Good Hosting? A leading Russian hosting provider with millions of domains registered around the world, RU-CENTER offers feature-packed plans at a good price point. RU-CENTER, a Russian web hosting company, was founded in 2000. It’s a large company with 350 employees, 900,000 customers and 7,400,000 registered domains in more than 650 domain zones. The website is available in Russian as well as American English. As one of the leading Russian hosting providers, RU-CENTER has a comprehensive offering. The Tier III (less than 1.6 hours of downtime per year) data centers are located in Moscow and Novosibirsk, Russia. Each center is equipped with high-bandwidth channels. Despite the large collection of help documents on the website, RU-CENTER does not post an uptime guarantee. What’s even more concerning is that past customers have commented on RU-CENTER’s inconsistent uptime, and the customer service operator I spoke with was unhelpful when asked about it. On the upside, the shared hosting infrastructure is a fault-tolerant Linux-based system, using robust Intel Xeon processors, and KVM container-based virtualization. The servers use SSDs, which means disk read/write speeds of up to ten times faster than conventional HDD. In addition to its solid infrastructure, RU-CENTER has plenty of useful beginner-friendly tools. 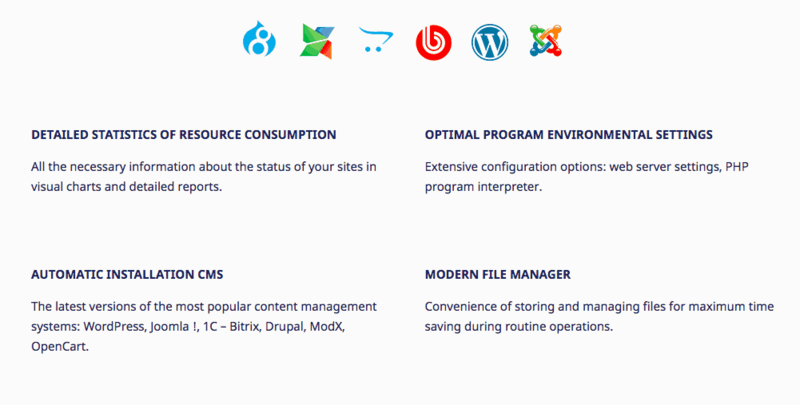 For an additional cost, there’s a website building tool with 140 ready-made responsive templates as well as one-click installations for popular CMSes such as WordPress, Joomla, 1С – Bitrix, Drupal, ModX, and OpenCart. Where the company really excels though is in its support for more advanced users. The shared hosting plans come with unlimited FTP access, cron jobs, and SSH access, which is often not included by other companies. RU-CENTER also supports PHP (version 5 only), Perl, and Python. When you’re ready to scale, RU-CENTER offers a selection of virtual private and virtual dedicated servers as well as hybrid servers. There’s a large range of prices available and the plans offer good value for money. The lowest-priced package is affordable and contains more than enough resources (4GB SSD storage and unlimited bandwidth) for most everyday users. However, if you anticipate needing more advanced features, you’ll need to upgrade to at least the next package up — which is still fairly-priced. Also, in all but the entry-level plan, SSL certificates and .ru, .rf, .site, .online, and .store domains are free. You can purchase the plans on 1, 3, 6, 12, 24, and 36-month terms, with the price significantly reduced if you purchase a longer term upfront. There is a 14-day free trial and you can upgrade at any time (you can only downgrade if you extend the hosting plan). If you’re the type of person who likes to solve problems without customer service, you’re in luck. There is a substantial help center on the website with documents covering many topics. Alternatively, if you’d like some assistance, there are a number of email addresses through which you may contact the relevant department, telephone numbers, and live chat — available 24/7. While this all sounds great on paper, RU-CENTER’s help desk felt incomplete to me. Even after reviewing a number of articles, I couldn’t find the answer to my question. I hopped on live chat and while I was promptly connected to an operator, they were unable to help and told me rather abruptly to send an email (which I did, but I never got a reply). RU-CENTER is one of the leading providers of hosting and domain registration in Russia. While I was left a little disappointed by the customer service, the infrastructure is solid and the plans are both affordable and feature-packed. Wondering how Nic.Ru stacks up against other Web Hosting companies? Enter any other Web Hosting company and we will give you a side-by-side comparison.